1. The top surface (both before forming furrows and in the bottom of the finished furrows) should be level from side to side and also from end to end (and thereby from corner to diagonal corner). Since water ALWAYS seeks ‘its’ own level’, the easiest way to accomplish this is to block the drainage outlet, flood the beds to saturation and slightly more, and then adjust the sand (and furrow) surfaces to be consistent with the water level. Note, all sand will settle some what during the first one to three saturation/drainage cycles. Some sand more so than others and not necessarily uniformly along the length and/or width. Therefore, it is suggested that one allow the bulk of this settling to occur before finalizing the surface preparations. 2. Because the top surface is level but the bottom of the bed is sloped down toward the outlet (drain) end, then the longer the bed length is, the greater the change of sand depth will be from one end to the other. The 30 to 33 cm depth suggestion is meant to reflect average depth at the shallow (uphill) end. The longer the bed is, the deeper the mean depth will become at the drainage (downhill) end. 3. To accomplish complete drainage of the bed (strongly advised), the longer the bed length is, then the more drainage assistance in the form of a longitudinal drainage pipe/tile is advised. As long as the bottom plane is sloped toward the exit, then beds of 3 to 4 meters in length may not require (but may still benefit from) drainage lines. Beds longer than 4 meters will probably benefit from drainage assisancet. Beds of 6 or more meters in length WILL require drainage assist provided by drain pipe/tile. 4. Beds of from 1 to 1.5 meter in width would require a single central drainage line. If beds are wider than this (for whatever reason you resist our recommendation), then two or more parallel drainage lines spaced approximately 2 meters apart (as many as needed) is suggested. 5. When using drainage lines, these need (do) not penetrate the end wall or cap of the bed. Merely terminate the lines into a small mound of pea gravel covering the drain line exit and also covering the the bottom slit (exit) of the drain end wall. This pea gravel covers the slit that is cut into the liner at the bottom of the end wall (NOT cut into the bottom plane of the bed). USDA-funded Commercial iAVs Trial – Notes on the Yield and Adjusted ‘ratio’. The USDA-funded Commercial Trial conducted by Boone Mora happened on the heels of the iAVs research conducted by Dr Mark R McMurtry…and confirmed the commercial potential of the method. At 2015 Philly Terminal wholesale prices. While I wish I’d said that because it sums up my personal view of the world. As it turns out, it actually belongs to Guy McPherson (Professor Emeritus – University of Arizona) – an outspoken (albeit very interesting) commentator on the future of human civilisation. Regardless of its origin, or circumstances, it’s a prescription that would be useful for all of us. SAND particle size distribution recommendation and Costs – AGAIN! I know what I know, did what I did, documented it … and this is what (ALL) I can speak to from authority/experience (recommend). The sand that I used performed spectacularly well in every aspect/way – IMO – I can’t image a greater efficacy. I’m not saying that some other fractionation will not ‘work’ … however defined/determined/felt … but how well is good enough for you is for you the decide? less than 0.25 mm (combined, including silt) at a maximum of 8% by volume (less is better). FYI, with this particle size distribution I experienced lateral water movement in pristine furrows (very first irrigation) of approximately 4 to 5 meters in length – no problem. For furrows of 8 to 10 meters in length I laid a 4-6″ wide strip of 5 mil clear polyethylene film in the furrow and cut closely spaced slits/holes in that film to help the water/wastes reach the end, but only for approximately the first week. After that, the biofilms and detritus layer had developed to the point where I removed the temporary perforated film (leaving any detritus on the actual film in the furrow). With or without an initial ‘film assist’, I observed virtually no erosion of sloughing of the ridges from day one or at any other point in time in any ‘system’. Believe it or not. Everything I say is intended for YOUR benefit, not mine. For further discussion on sand, please use the search function (upper right) to access previous discussions – including as it compares to gravel. And while on the sand topic (AGAIN) … I keep hearing complaints about it being so hard to find (in the US that’s BS) and also that is so damn expensive (also BS). In the US virtually anywhere, sand, pea gravel and 3/4″ gravel are basically the same price by volume and/or by weight, whether from a quarry or in bags at your local big-box store. Price varies by location and volume ordered, typically from $20 to $40 per ton (as low as $11yd3 in upper Midwest States). In fact, for our US friends, it’s as close as your nearest Home Depot or Lowe’s. A company called Quikrete supplies both retailers with a diverse range of aggregates…including graded sands in many types and sizes…and for all manner of purposes. For example, in the Quikrete product line: product # 1961 is 30-70 mesh or 0.2 to 0.6mm), #1962 (20-50 mesh or 0.3 to 0.8 mm) and #1963 (12-30 mesh, or 0.6 to 1.7 mm). With these particle size distributions, one might get away with using all as #1963, but personally, for every 10 bags, I’d make 3 of them #1962 to increase SSA, improve moisture retention and also improve lateral water flow along the furrows until such time as a detritus layer is established. 1 cubic yard of dry sand weights from 1.3 to 1.35 ton, so per cubic yard quarry tonnage rates range from $26 to $54/ yd3, or $34 to $71/ m3. Bulk bags in the midwest states (e.g. Oklahoma): 3000# bulk-bag of 20-40 US sieve #24 filter sand = $206 delivered to OKC (from Wisconsin, March ’17)). At 2600#/yd3 = 1.15 yd3 or 0.88 m3. for $179/yd3 or $234/m3. Here in Montana, bags (sand, pea gravel, etc) at Lowe’s (et al) are $4.25 /50#. (in bags you’re paying 3 to 4 times as much by volume than in bulk) Local quarry prices range $35 to $45/cubic yard for single units of washed graded sand or $30 to $35/cubic yard in 10-yard truck loads (plus $0.25 to $0.30 per mile) I have a choice of at least 3 quarries, 2 concrete batch plants and a cinder-block plant just within 60 miles in one direction – each with multiple grades (size distributions) to choose from or mix and match). In other words I can have 10 yards delivered (enough for 30 square yard of biofilter for under $500 – all day long from multiple sources. (<$1.85 ft2, <$20/m2). Yes, it cost much more in bags … but still damn CHEAP compare to clay ball crap. Delivered quarry sand at $50/yd3 is 25 times LESS (+/- 4%) than expanded clay pebbles (which is a vastly inferior media relative to sand in several aspects and it also degrades (breaks down) over time (sand does not degrade). In iAVS, the sand does it all = 1) mechanical filtration (99+% particulate removal) , 2) exponentially superior Nitrification substrate than ‘alternatives’, 3) Oxygen rich ‘home’ for biofilms and soil microbial community including robust rhizosphere, and 4) excellent, aerated anchor for vascular plant roots. That’s 4 critical (key) functions all in one package, at 4% of the cost of a significantly inferior ‘alternative’. What’s not to love (complain about)? I can’t speak for Gary but I am DONE with the entire sand subject. If sand is felt to be too difficult to source and/or deemed to be too expensive for what it can do for you, then you would probably not be successful in maintaining a functional iAVs or any other AP so-called ‘system’ – IMO. I can’t stress strongly enough the importance of pH on biofilter performance and on plant growth (yield). 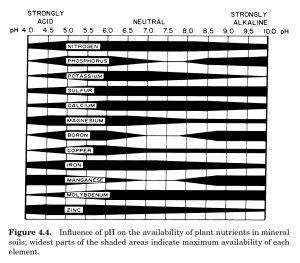 The recommended pH for iAVs (water) is 6.4 +/- 0.4. pH will not only influence nutrient availability for the plants but also influences microbial metabolism (activity, efficiency and even community/species composition). Nitrification is most efficient at pH 7.0. In iAVs, there is such a vast surface area available for biofilms that more than adequate nitrification occurs at even as low as pH 5.0 (at least over intervals of several weeks). The toxicity of True Free Ammonia for fresh water fish rises above pH 7.0 and goes exponentially more toxic above pH 8.0. In other words, TAN is far more toxic at higher pH and than at lower pH. 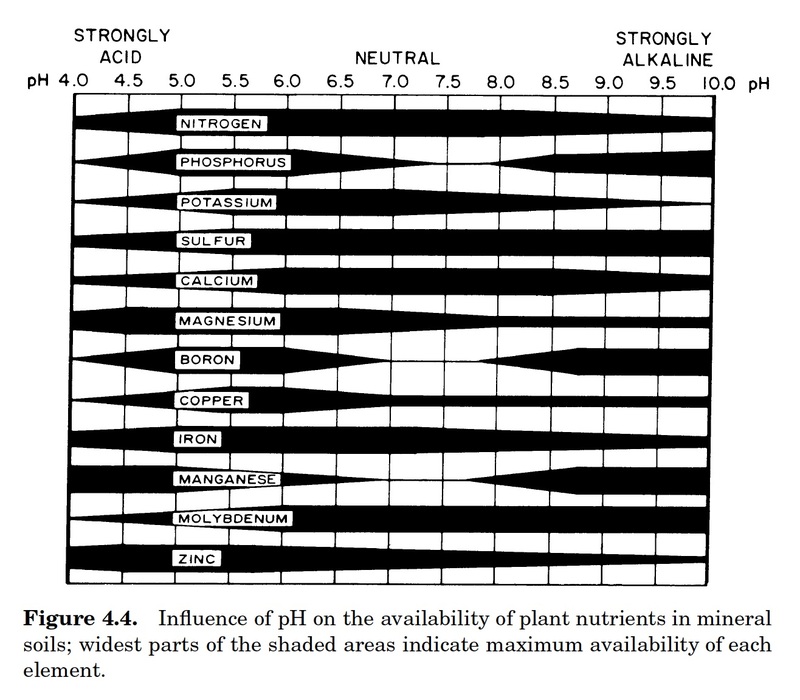 Effect of pH on plant assimilation of elements, varies by soil type (and/or if soilless). 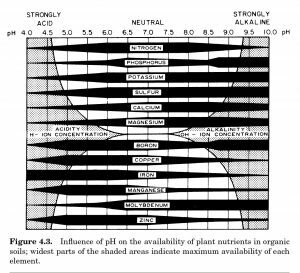 Hydroponic nutrient solutions are NOT organic – repeat NOT and never can/will be – so the above chart applies more in hydroponics (and likely DWC) than does the ‘organic soil’ chart below. An iAVs biofilter prior to the inclusion of detritus/organics would be considered as mineral. With the addition of organic solids (detritus) and with a developed soil microbial community, the biofilter becomes (is) ‘organic’ – aka includes Carbon-based biomolecules – (except for the ammoniacal Nitrogen fraction (TAN)). However, TAN is not the only N source in iAVs. Nitrogen is also sourced from amines, amino and nucleic acids (proteins), chlorophyl, peptides, some enzymes (hydrolases), ureides, et al. – each (with rare exception) being made plant available via microbial transformations (often in a sequence involving multiple microbe species, as too with most other elements when sourced from complex organic biomolecules). IMO, so-called ‘aquaponicists’ need to loose their apparent ‘fixation’ on (obsession with) Nitrification (‘seriously’) and start to include active consideration of the availability of ALL the plant essential elements. NOTE: Calcium toxicity rarely occurs. HOWEVER, high levels of Calcium can compete with (inhibit) both Magnesium and Potassium (and possibly Phosphorus) uptake by plants, resulting in assimilation deficiencies of Mg and K regardless of how much of these elements are in the media/solution. In animals (vertebrates), excess Ca is antagonistic with Phosphorus metabolism. Additional Note: I’ve seen several submitted sand composition analysis recently indicating a percentage (1 to 2% by volume range ) of Calcium oxide (CaO). This compound is highly water soluble and extremely basic (WILL strongly raise pH in a proverbial heart-beat). I suggest avoiding media that includes CaO as well as similarly significant levels of Calcium carbonate (CaCO3) as well as Ca(OH)2 and/or CaO2. Charts sourced from “Knott’s Handbook for Vegetable Growers, 5th Edition”, an Industry Standard reference for many decades. There seems to be some ‘confusion’ about feed rates and I believe we’ve mentioned this far more than once in some blog posts and/or comments (both feed inputs and composition definitely covered in publications). Rather than trying to find that or asking you to do so, I’m copying below some more recent responses to feed related questions. Do note that all this is strictly in regard to Tilapia with a balanced commercial feed (in my case of a known elemental composition). I highly encourage others who are serious about plant production to have their fish feed analyzed (by a qualified lab) for the plant essential elements (yes, it will have a cost, what doesn’t? – except my efforts and time that is ! – to date). If you have the option, feeds ‘fortified’ with mineral and vitamin supplement ‘packs’ are not necessary. IMO, knowing what the amount of plant nutrients are in a particular feed will be useful information for you to have (and report). If you have your’s tested, report the results to us and I/we will provide feedback. Note: Anyone growing goldfish or other carps, perch, bluegill etc. should also know (IMO) what their feed composition is and I can offer ZERO suggestions as to what the appropriate feed rates (or temps, DO, etc) are at any size or density for any species except tilapia. Also, if you have some prior experience with gravel or clay-pebble media, you will find being able to feed at a much greater rate when using sand as the filter media. I also looked up the feed input rate data over the first 103 days. The one-year feed input rate averaged 133 g/m3/day….which at v:a 1:6 = 22.17 g/m2/d. SO … I ‘feel’ that approx. 150 g/m3/day long-term average is a viable target (perhaps more w/ continuous/vigorous fruiting plant production). At v:v 1:2, then v:a= 1:6 , so feed rate (‘wastes’ from) per m2 of filter in the 25 to 30 g/day range as a long term average (until determined either excessive/insufficient). SO, if you can’t get the stocked fish to consume enough feed to sufficiently fertilize the entire biofilter area you have available, then temporarily reduce the portion of filter being irrigated/fertilized until they will eat enough to support more plant growth. This can be accomplished by temporarily blocking off the furrows (length of) to limit the area receiving nutrient and just grow plants (initially) in that section until you are able to feed at a higher rate and increase active filter/plant area. At v:v 1:2, then v:a= 1:6 , so feed rate/m2 of filter in the 25 to 30 g/day range (until determined either excessive/insufficient). During a system start-up )with small fish and young plants) one can feed as much as the fish will eat twice a day and the plants should be okay (was for me) with the feed input increasing as both the fish and plants grow. I believe that my initial feed rate during the first start-up ( still ‘cycling’, microbial populations just starting to develop) was 40 g/m3/day (at v:v 1:2 = 6.7 g/m2/day and was at 120 g/m3/d (20 g/m2/d) or more within a couple weeks. What is the optimum water:sand ration? 1:2.4 or 1:1.5? Depends on several factors, but over the long-run, the amount of feed input determines the amount of fish ‘waste’ generated, and the amount of ‘waste’ being accommodated (on average, over time, many months to a year) would dictate the appropriate filter volume. More feed = more ‘waste’ = more filter surface and more soil biology to process. We have been suggesting v:v =1:2 (or v:a 1:6) for first time adopters as suitable for from 80 to 100 tilapia per cubic meter grown from 15 g to 250+/- gram in 3 to 4 months assuming they are feed a balanced ration fed all they will eat twice a day. Once they’ve attained 250 g (approximately) then the ‘standing biomass’ should be reduced (by culling or increasing volume(s)). What is the fish density? by weight or by number? assuming 15 grams fingerlings? At v:v 1:2, one should be able to do well at N=100 m-3 (reduce N when attaining 250 +/- 50 g average size). Growth rate and FCR was slightly better in the higher ratios due to ‘cleaner’ water. Plant yield per plant and per area was better at the lower ratios but total plant yield per filter (not area) and per gram of feed input and per fish growth/increase was greater at the higher ratios. The combined yields per unit feed input was found to be between the 1:1.5 and 1:2.25 ratios (under those prevailing conditions), So, I’ve suggested 1:2 for beginners for both simplicity and leaning toward the larger biofilter capacity to error on the side of caution (for the fish). Also note that this was with (for) indeterminate tomato and cucumber and not for leaf crops, legumes and/or cole (Brassica) family. There is no magic one-size-fits-all number for feeding rate. All feeds vary in composition, All fish species and growth phases have different requirements (upper and lower limits and an unknowable optimal rate on any given day), All sand, water qualities and locations will be at least somewhat different – overall and as time/seasons progress. All plant species and phases of their growth will have somewhat different nutrient uptake rates (by amount and element – each and every day). The fish will indicate through their feeding behavior if they are hungry (when full). The plants will ‘tell you’ by their growth rate and any foliar symptoms that might develop if they are getting enough nutrient or not. As a ‘system’ matures (elements accumulate), feed (nutrient) input each and every day is not critical from the plant’s ‘perspective’.. Longer term (monthly) feed rate, aka ‘waste’ generation should be approximately balanced with the prevailing average plant nutrient uptake. As the ‘soil’ develops, as with an in-ground garden, there is no need to add fertilizers to the media (plants) each and every day (or even week). Sure, the fish will want to be fed every day – but provide enough feed ‘run through’ enough fish to supply the nutrient demands of the plants (number, species) you are growing. Not more (long term), not less (long term). Balance. There are dozens of variables ‘at play’- every day, changing one aspect/parameter WILL influence everything else eventually, This is the ‘nature’ of an (every) integrated “SYSTEM”. Know what is actual happening in your system (pH, temp, DO, feed input/quality, FCR, etc.) , Observe what is happening carefully and often. Observe, assess, adjust, observe, assess adjust, repeat, repeat repeatedly. 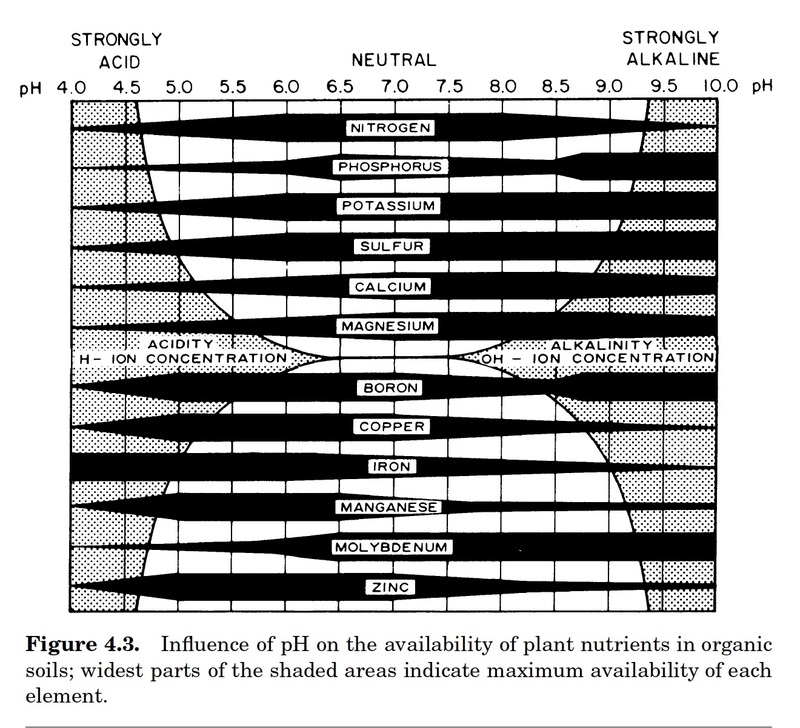 REMINDER: Plant nutrition is STRONGLY influenced by pH. … with 6.4 to 6.5 generally ideal for most species and elements. I suggest the outer limits for good plant nutrition/growth to be pH 5.8 on low (acid) side and 6.8 on the high side. Most AP seem to claim/prefer to exceed pH 7.0. This is NOT ‘good’ (recommended). Facts are facts and unsubstantiated opinions aren’t. Believe it or not. Totally your choice. Every and ALL content I/we provide is exclusively intended to be to your direct benefit. Argument (in the absence of evidence) is not appreciated. And, as another reminder, iAVs is 90+% about plants. Fish growth is a means to an end. It’s the metabolic ‘waste’ products (and microbial ‘processing’ thereof) from the fish growth (feed) where the value resides (both economic and nutritional). If you are merely interested in fish production and with tinkering with equipment, plumbing and sundry gadgets&gizmos then (IMO) stick to standard recirculatory aquaculture practices (not so-called ‘aquaponics’ – whatever it is you ‘think’ that is/involves). Seriously !